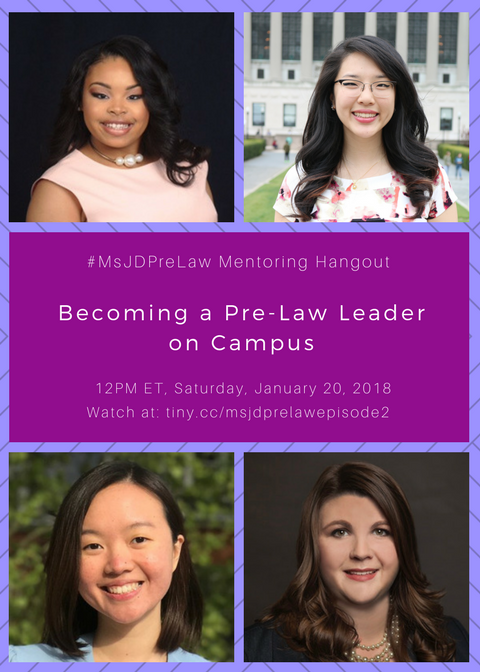 Becoming a Pre-Law Leader on Campus - #MsJDPreLaw Mentoring Hangout (Ep. 02) | Blog | Ms. JD | Determined to Rise. Watch the second episode of our #MsJDPreLaw Mentoring Hangouts on "Becoming a Pre-Law Leader on Campus"! This will be live-streamed at 12pm ET on Saturday, January 20, 2017, at tiny.cc/msjdprelawepisode2. Erin Callahan: Ms. JD Board Member. She was the President of Women in Law and The Student Bar Association at Dedman School of Law. Erin recently left the insurance industry and is now in private practice at a small firm in Houston, Texas. Moniel Sanders: Class of 2019 undergraduate at Indiana University Bloomington. President of the Pre-Law Black Law Student Association at Indiana University Bloomington. Margaret Zhu: Class of 2019 undergraduate at Columbia University. Co-President of the Columbia Pre-Law Society and incoming investment banking summer analyst.